The first time I recall seeing him act was in Thelma & Louise in 1991 and it was one of those scene stealing performances where I wondered, “Who the heck is this guy?” Within four years, and after his performances in A River Run Through It, Legends of the Fall, and Se7en—everyone knew who Brad Pitt was. And while he’s a tremendous actor, personally I haven’t always appreciated most of the movies he’s been in the past 15 years. Moneyball goes down in my book as the perfect Brad Pitt movie. (I haven’t seen Tree of Life yet, but I’m guessing it’s going to be a solid film, but a solid Terrance Malick film.) That’s not to take anything away from Moneyball’s director (Bennett Miller) or screenwriters (Steven Zillian and Aaron Sorkin), it’s just that their talents all came together to tell a great story that is driven by an actor in his prime. And my guess is that they’ll all be rewarded when the Oscar nominations are announced. * I will admit that baseball was my first love which is part of what is so special to me about this movie. From rooting for Cinncinatti’s Big Red Machine and to going to spring training games at Tinker Field in Orlando as a kid, to playing the game through high school, and as an adult going to games at Wrigley Field, Fenway Park, and Yankee Stadium, the idea of baseball has been a constant companion even though I don’t follow the game much any more. 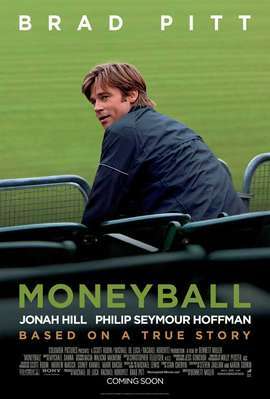 But even if baseball is foreign to you, I think Moneyball works on so many levels you can enjoy the movie even if you’re not a fan of the game. Art Howe is not a fan of Moneyball. If you go by Art Howe’s coaching and playing record he’s had a mediocre baseball career. (His lifetime batting average was .260 as a player, and he lost more games than he won as a coach.) And while he may not like how’s he’s portrayed in the movie he may appreciate someday that the movie immortalizes his role at the peak of his baseball career—and I imagine it will help his speaking fee and opportunities if he choses to go that route.